"The moment in 1989 when David Dinkins learned that he would win the Democratic nomination, paving the way for him to become New York City's first black mayor. 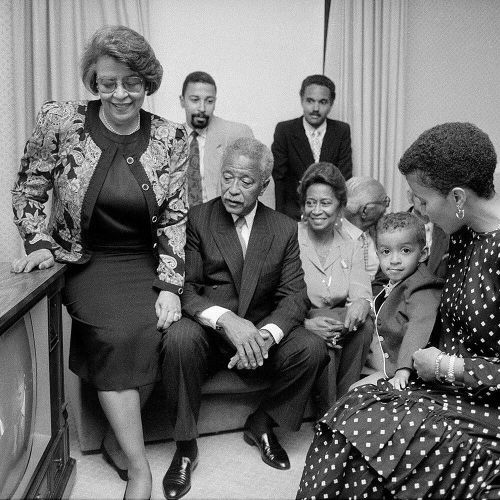 In the photo, taken on September 12, 1989, by the @nytimes staff photographer Chester Higgins Jr., Dinkins is pictured sitting calmlyon a sofa in a hotel room with his excited wife, daughter and son and their families. "I was the only media photographer allowed to witness Mr. Dinkins at the crucial moment when the final primary results were tallied and Mayor Koch conceded," Chester told @nytimes. During #blackhistorymonth, we're sharing unpublished @nytimes photos that reveal major moments in black history. Visit the link in our profile to read more about the day David Dinkins made history. #UnpublishedBlackHistory" By nytimes on Instagram.